Prboom is a enhanced doom engine. Works well on my Wiz. 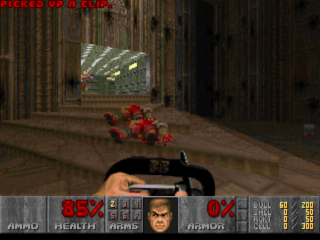 One thing to note: doom.wad has to be renamed to doom1.wad or that version of the game won't run. No music played, even though I do have timidity installed. Does timidity go in the root of the SD card, or the root of the NAND? Hey Forgeflow is the timidity a game file or a separate program? Fix for Plutonia is to edit the Plutonia.gpe file and change first line from "#!/bin/bash" to "#!/bin/sh", then it will run. How is the smoothness compared to Gp32 and Gp2x versions? Excellent work. Got Timidity to work after a bit of tinkering. Love playing the different versions of Doom. It runs great only thing i hate is that the saves all at the same directory. And i wish that the Counterstrike 2.5 mod come to wiz. It's well done - but I can't run PWADs with it. Please fix. This works perfectly, but on exit it doesn't terminate the process and the .gpe is shown still running. It eats up quite a lot of resources: 3 instances of prboom running at the same time slowed everything down, a lot. Is there any way to use cheat codes? Awesome i got this running ultimate Doom, Doom 2, and all those fun mods like simpsons doom 1 and 2 and star trek doom.